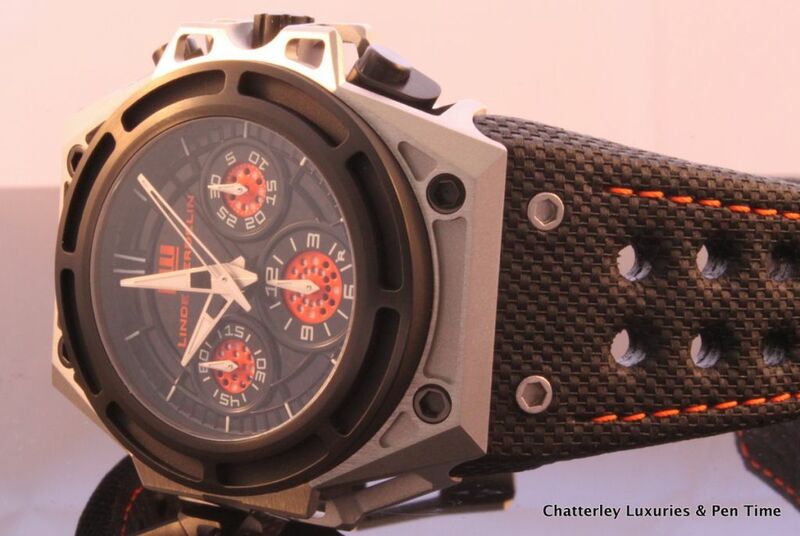 The SpidoSpeed Black Orange is a visually striking chronograph. This timepiece is individually crafted with a complex fully skeletonised case, a multiple-layered dial, and a revealing beautiful movement to offer you a complete 3-dimensional experience. 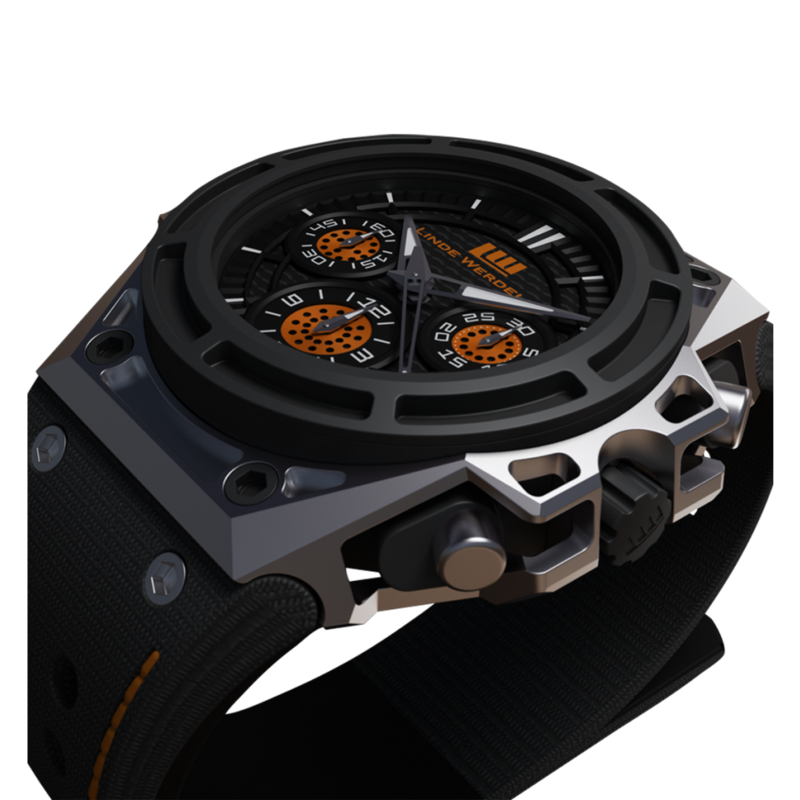 The SpidoSpeed has been designed with inspirations originating from the racing car industry. 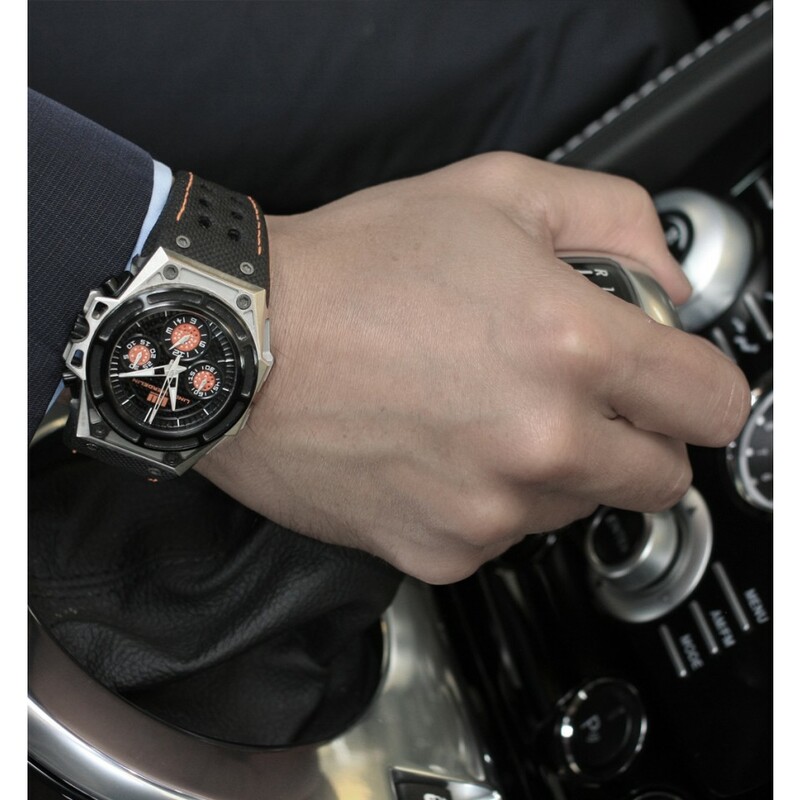 The reference is evident in every part of the timepiece, from the robust skeleton case produced with weight reduction technology, the material used on the dial, the design of the sub-dials, to the detailing of the strap. 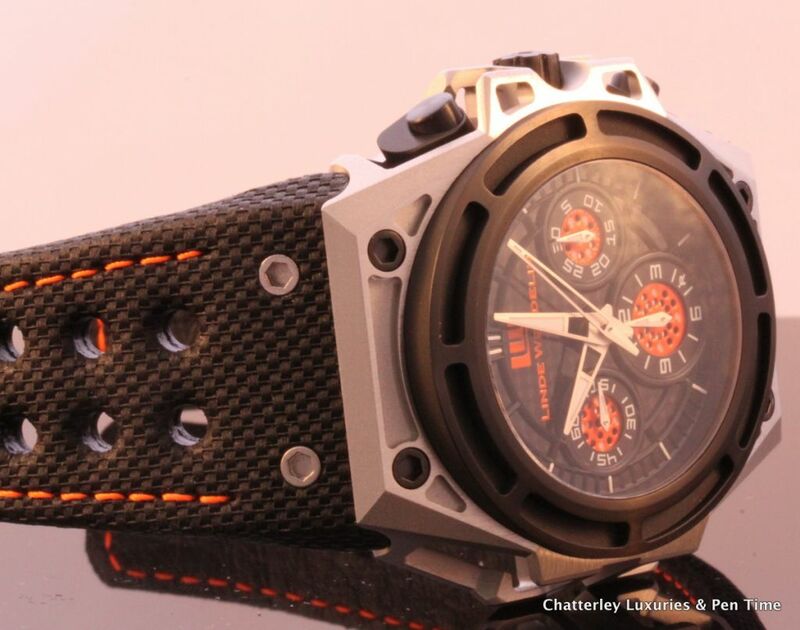 This model comes with a matching SpidoSpeed black textured calf strap with orange stitching, and an ardillion buckle, and houses an upscale custom-made integrated chronograph movement. Only 100 pieces in Series A are available worldwide. 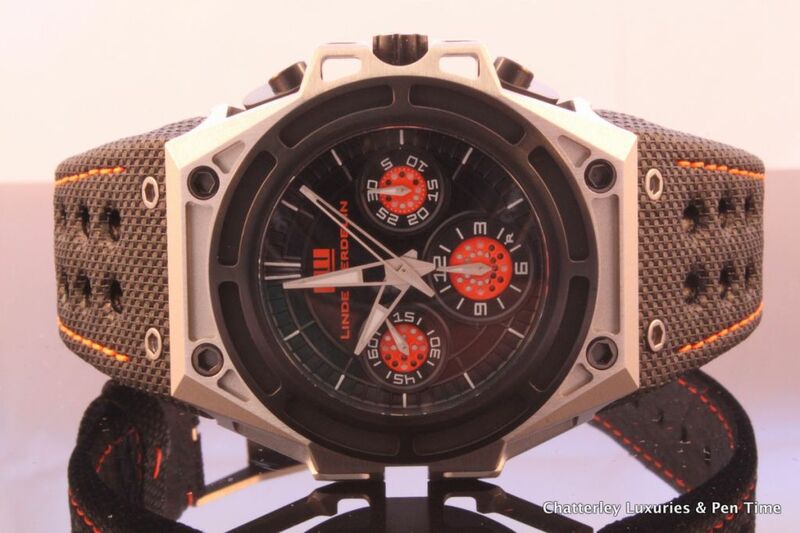 The SpidoSpeed is Linde Werdelin’s first chronograph model, designed with strong reference to the first series of the SpidoLite, revealing yet more inspirations from the racing car industry. 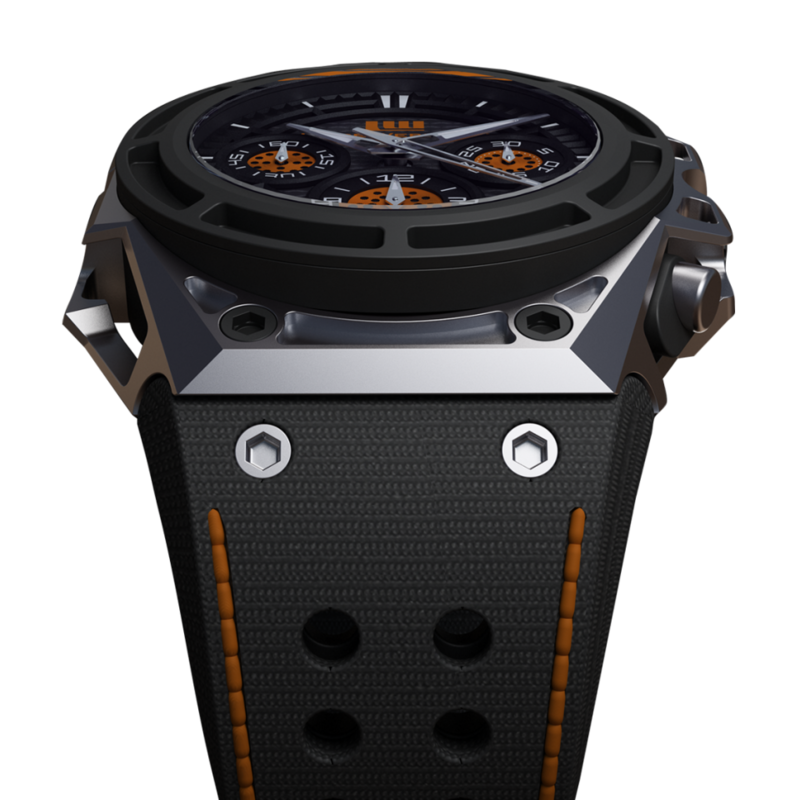 The SpidoSpeed Chronograph is constructed of a technically-complex fully skeletonised case and a multiple-layered dial to bring you an all round 3-dimensional experience. 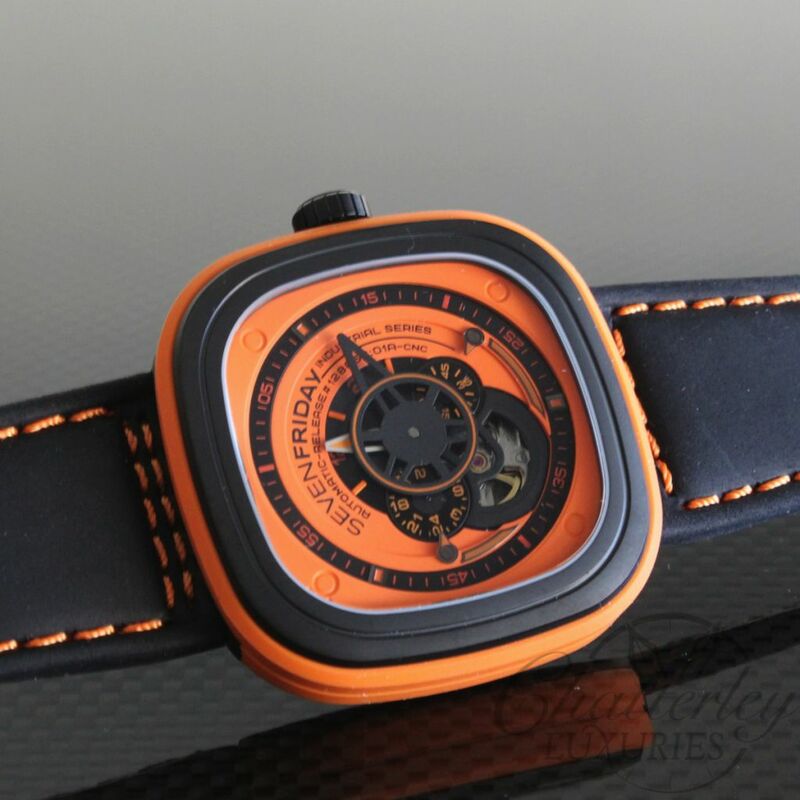 The SpidoSpeed Black Orange has been conceived with brand new three-part case construction. 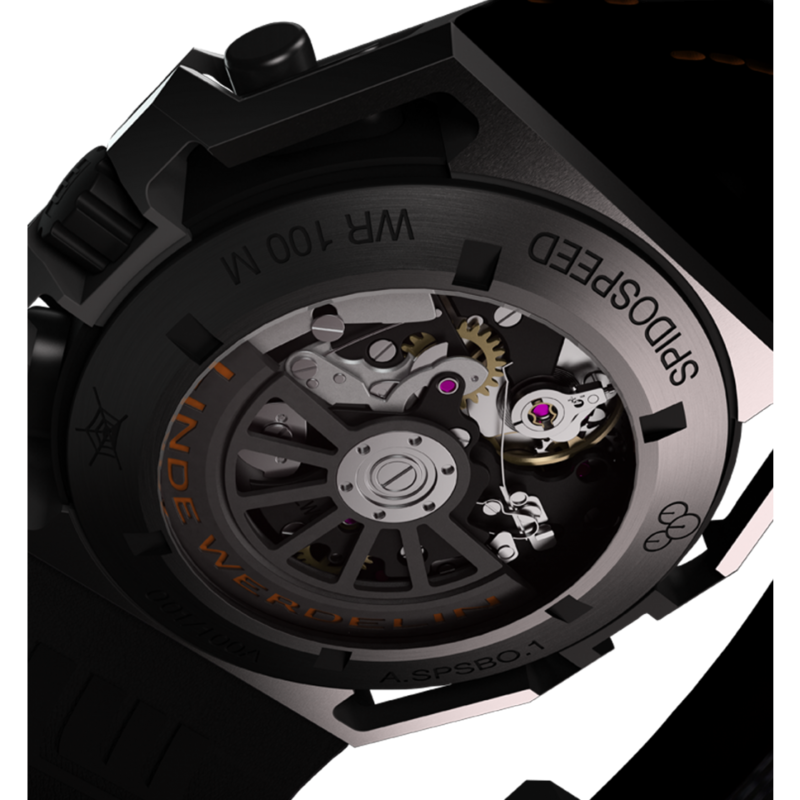 Technically more complex, the SpidoSpeed carries an explicit reference to the robust skeleton structure of the original SpidoLite. 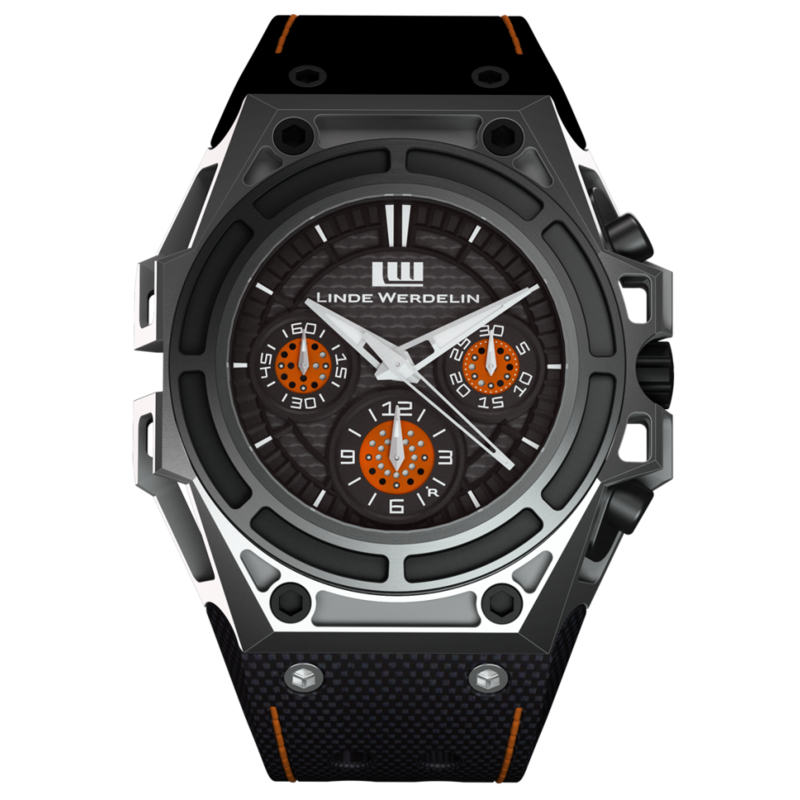 The black in the Diamond-Like-Carbon (DLC) coated bezel, crown, and pushers brings out a perfect contrast against the orange in the subdials on a steel case creating a visually striking timepiece. Perfecting the construction of the case was a two-year long and extremely challenging procedure. The skeletonised part of the case has been the most complicated and time consuming to produce due to the complexity of the shape. It takes lengthy hours of meticulous work by hand to construct and complete a case, as each requires exceptional accuracy. 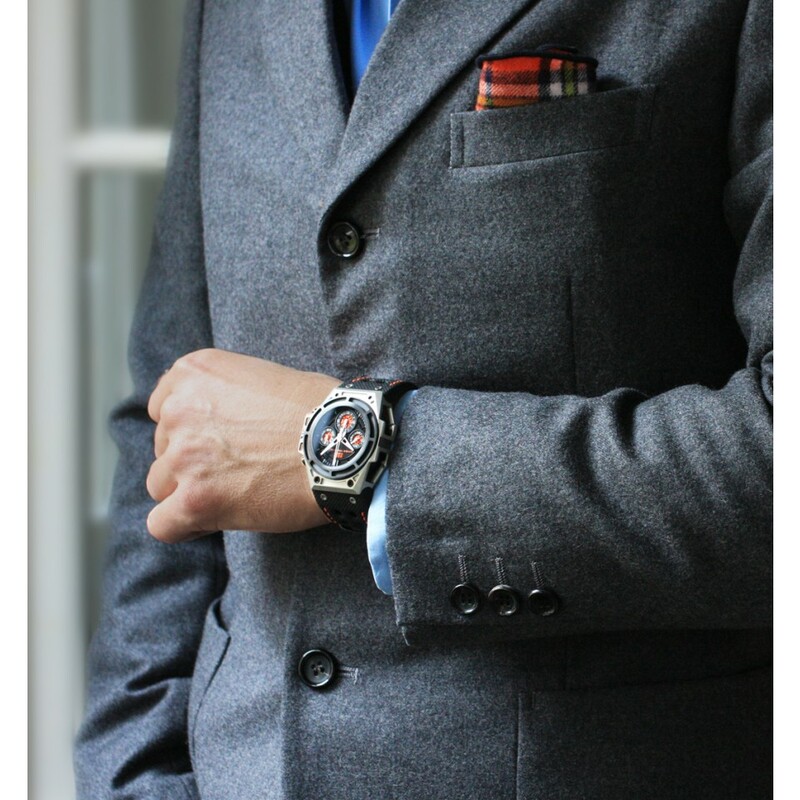 The dial has been constructed into two parts comprised of as many as ten layers to accentuate the 3-dimensional experience, following the same design philosophy as the case and adding depth to the watch when reading time. 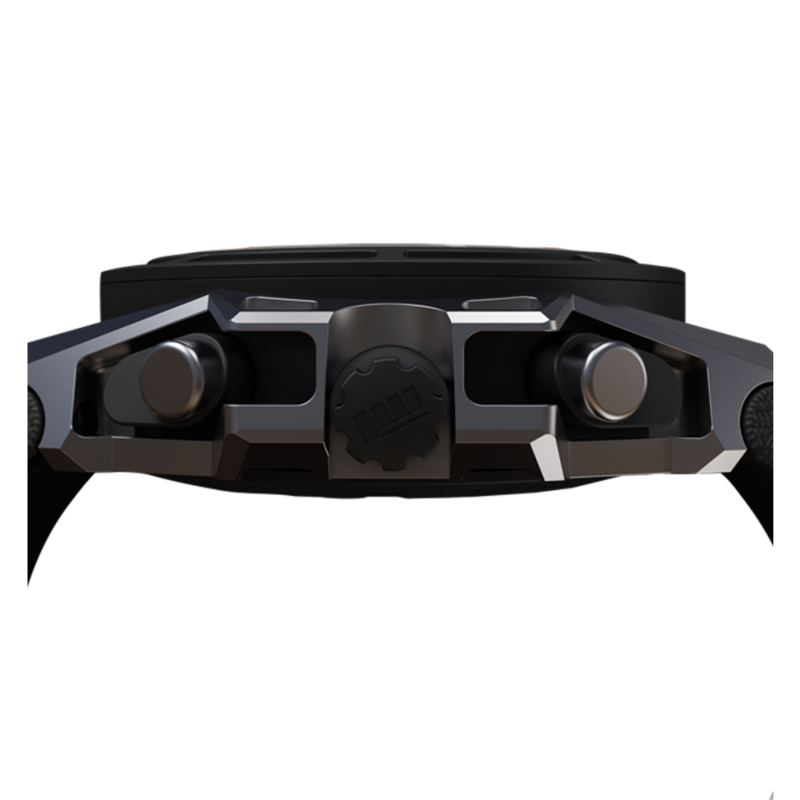 The ability of the eye to focus on millimetres makes the SpidoSpeed experience most interesting. 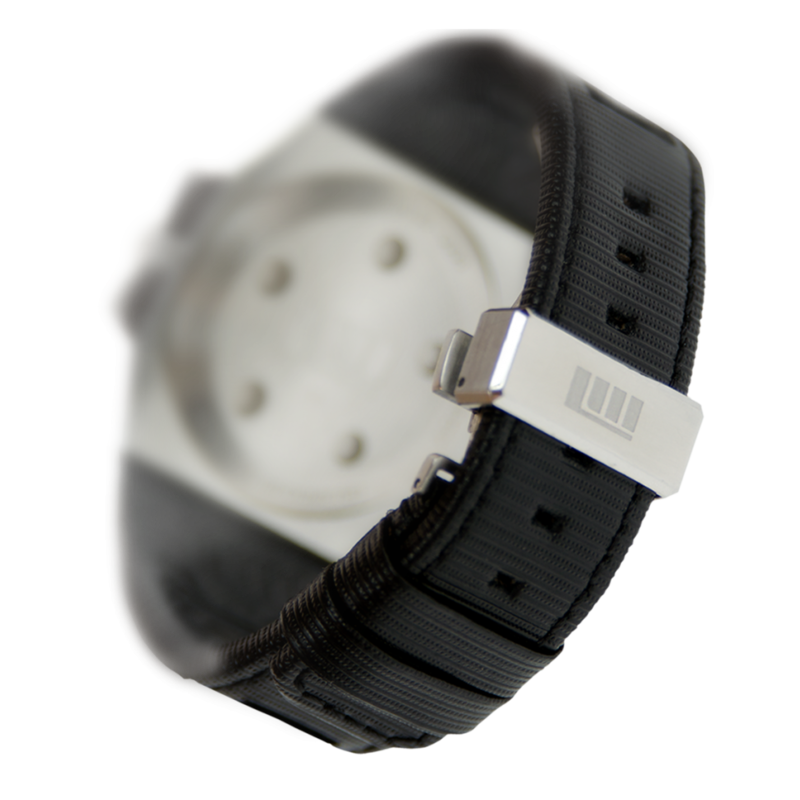 The letter “R” at 4 o’clock on the hours sub-dial, stands for “The Rock” or “The Reef” and indicates how long it takes to fully charge the instrument. 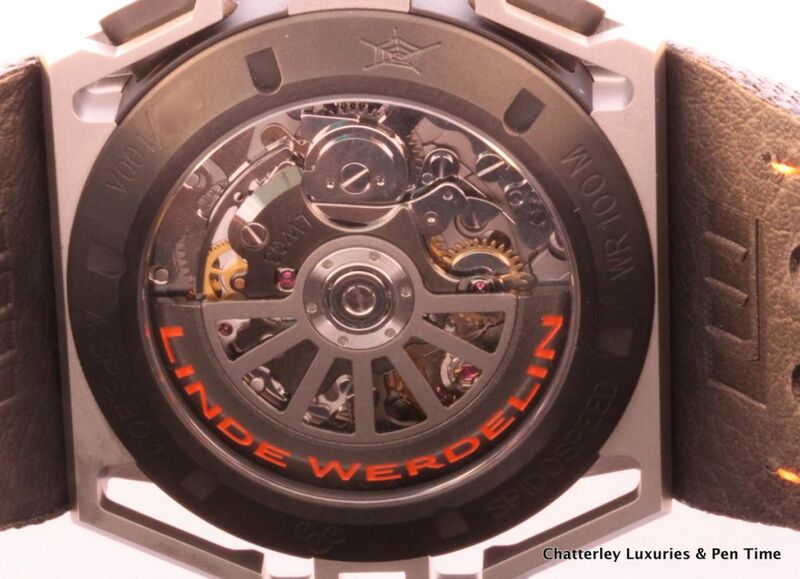 In the heart of the SpidoSpeed is a custom-made integrated chronograph movement powered by a skeletonized rotor engraved with ‘Linde Werdelin’ showing through the sapphire crystal case-back. 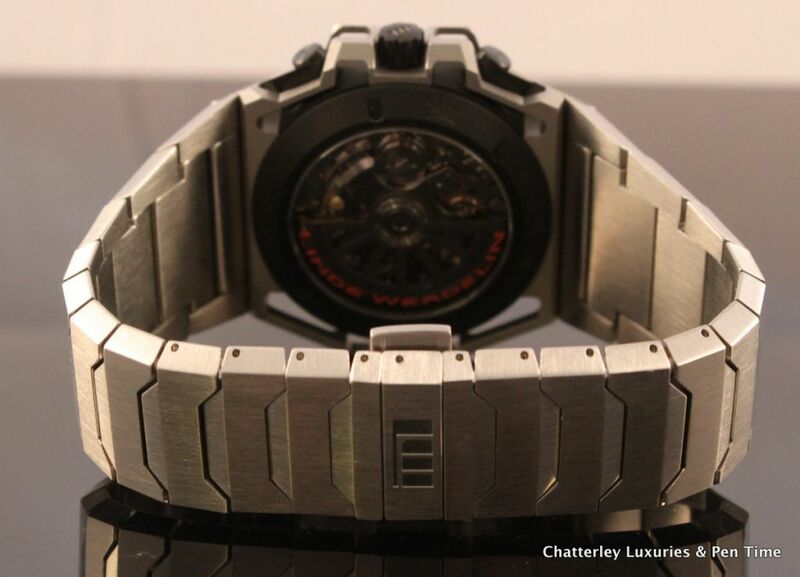 This bespoke movement allows the crown and pushers to be completely aligned and to facilitate the attachment of the Linde Werdelin instruments. 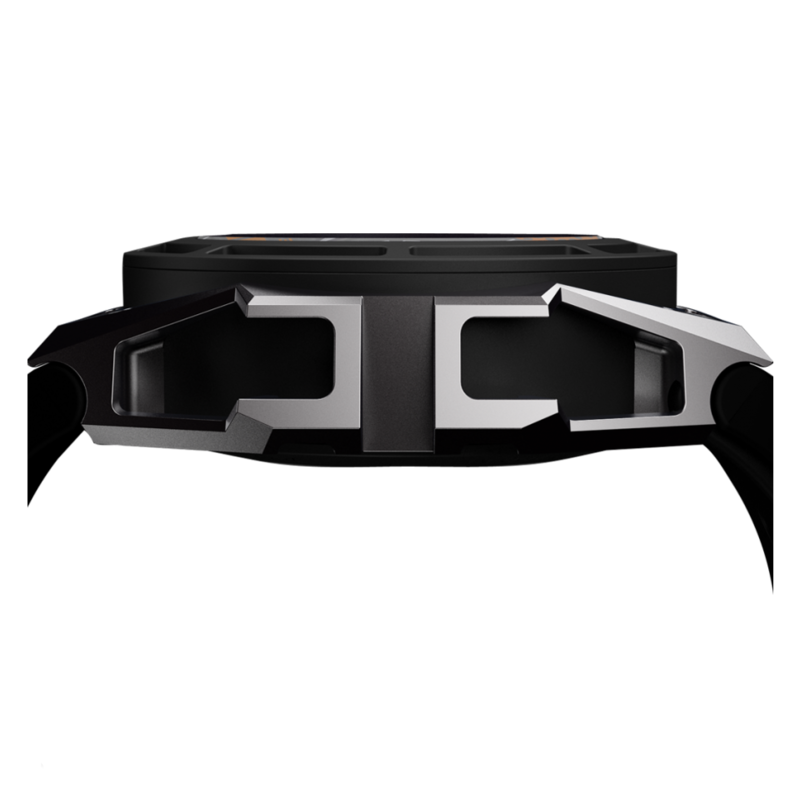 DLC stands for Diamond-Like-Carbon, a hardening treatment to enhance durability and scratch resistance. A DLC coating forms a surface 3 times harder than steel, and second only to diamond. 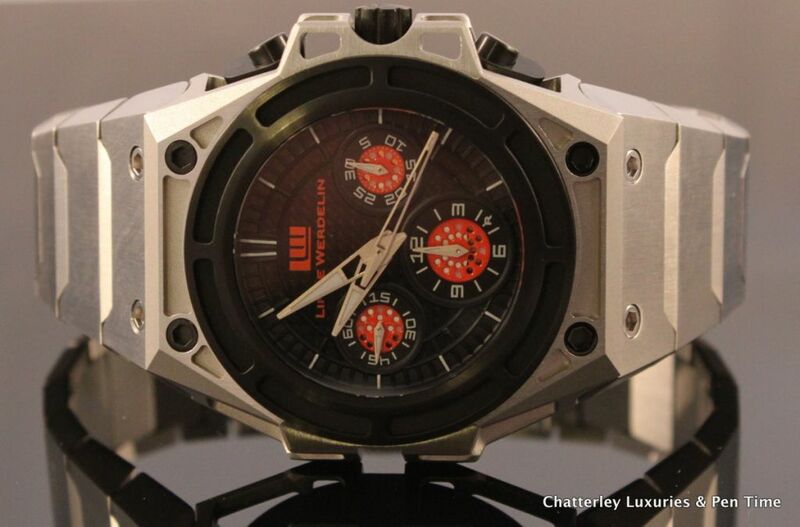 Linde Werdelin’s DLC is one of the strongest employed in the industry. 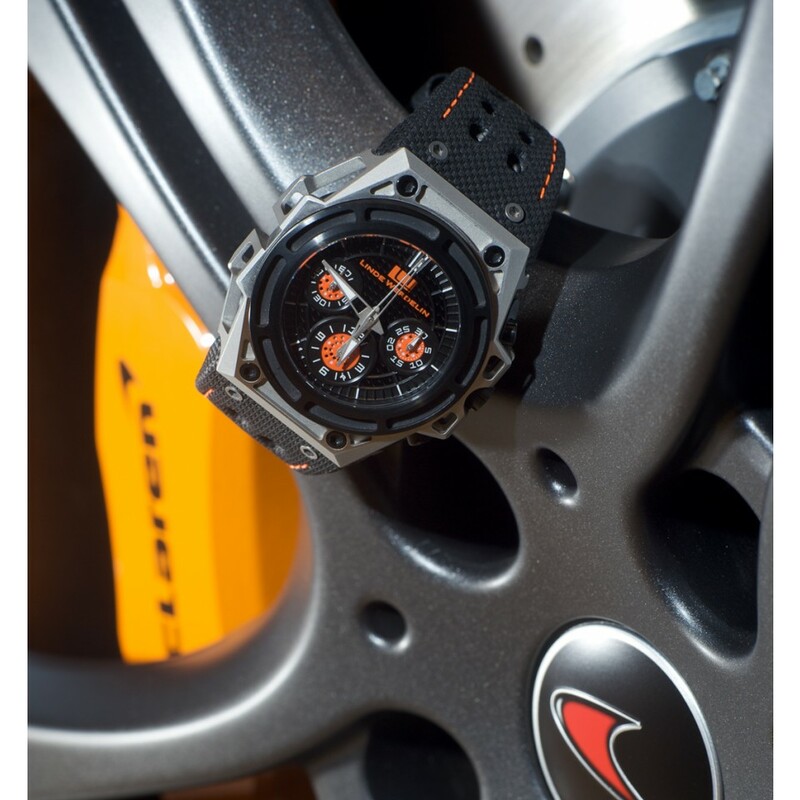 SpidoSpeed Black Orange is available worldwide in a numbered series A of 100 pieces. 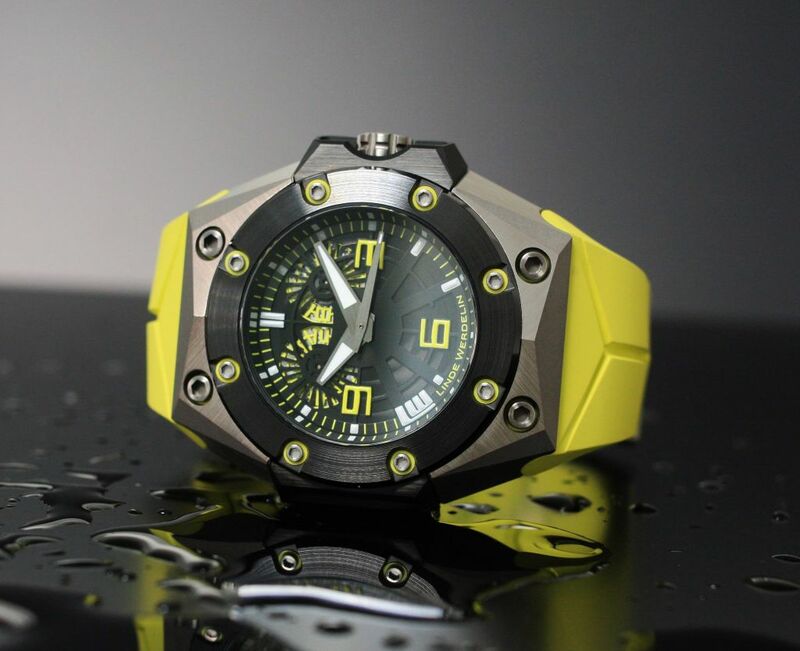 The SpidoSpeed also comes in 6 other versions: Gold, Black Diamond, Gold DLC Titanium, Black DLC, Anthracite DLC, and Steel. 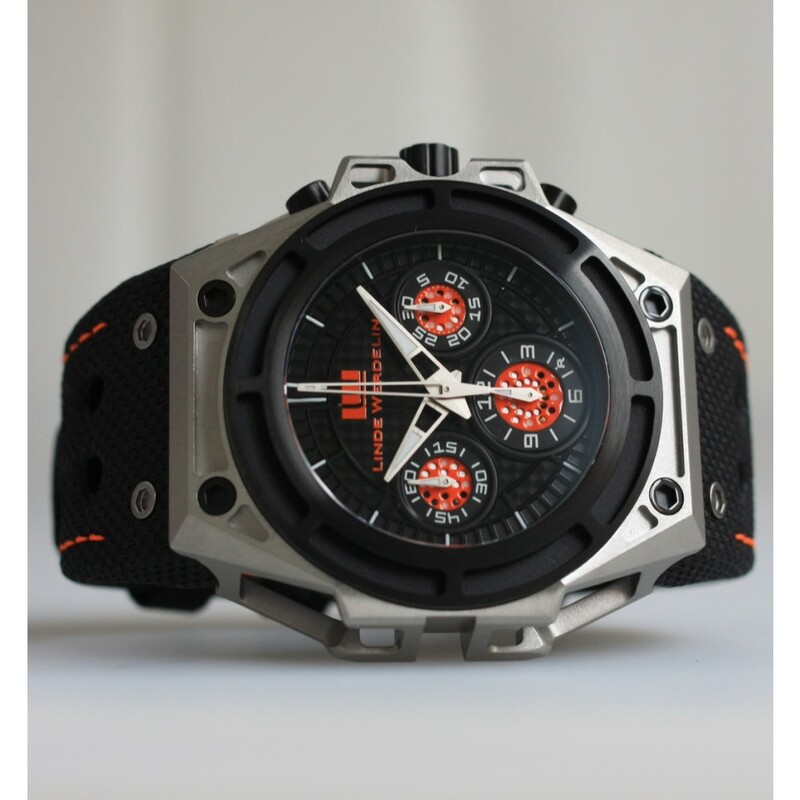 This watch is very versatile. 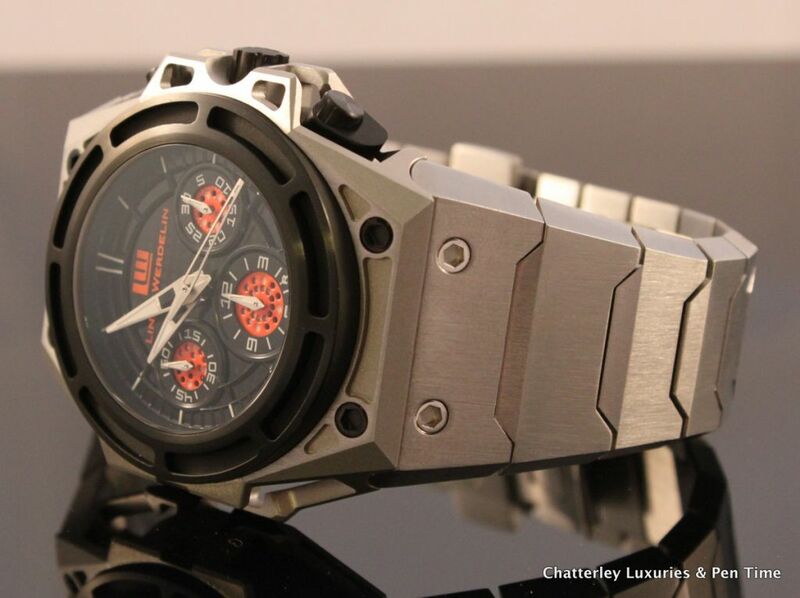 It shown here with a Linde Werdelin Steel Bracelet as well. 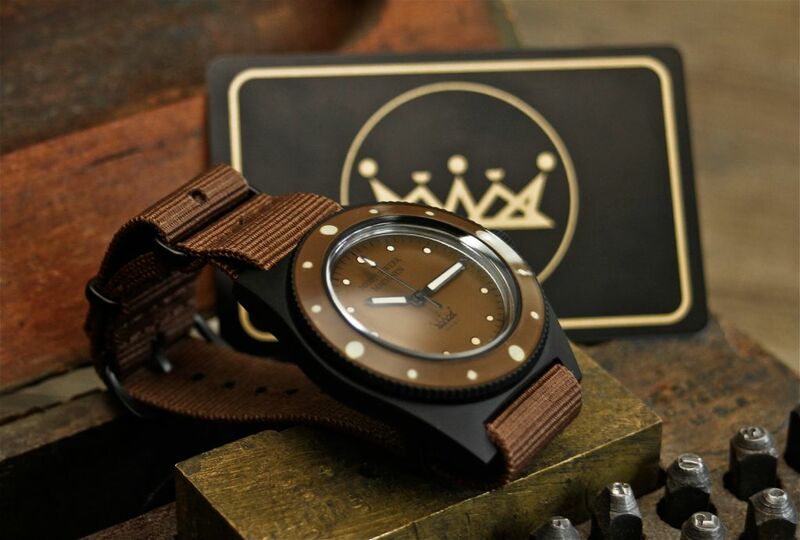 This Accessory can be purchased with this watch and is in stock.